David J. “D.J.” Kennedy, MD, clinical associate professor and residency program director in the Division of Physical Medicine and Rehabilitation with Stanford University’s Department of Orthopaedics, has been named chair of the Department of Physical Medicine and Rehabilitation (PM&R) at Vanderbilt University Medical Center (VUMC). Kennedy will join the faculty on April 1. Kennedy succeeds the department’s founding chair, Walter Frontera, MD, PhD, who stepped down in February 2017. Jeffery Johns, MD, associate professor of Physical Medicine and Rehabilitation and medical director for Vanderbilt Stallworth Rehabilitation Hospital (VSRH), has served as the department’s interim chair while a committee completed a national search for Frontera’s successor. 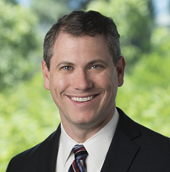 At Stanford, Kennedy’s clinical focus has been on physical medicine and rehabilitation, particularly spinal disorders and diseases. His research focuses on the safety and efficacy of treatment options for spine and peripheral joint pathologies. A frequently invited lecturer both nationally and internationally, Kennedy is also the author or co-author of more than 150 peer-reviewed journal articles and abstracts, invited book chapters, online articles and newsletters. “Since its founding six years ago, the Department of Physical Medicine and Rehabilitation has become an increasingly vital component of our clinical, training and research missions. We are excited that Dr. Kennedy is joining the Medical Center in this important role and I look forward to his contributions as we continue to advance the department’s scope and impact on the patients we serve,” said Jeff Balser, MD, PhD, President and Chief Executive Officer of VUMC and Dean of Vanderbilt University School of Medicine. Kennedy will lead a department that currently includes 43 faculty and approximately 200 staff. PM&R includes clinical, training and research programs, as well as oversight for academic and clinical programs at VSRH. Clinical services offered through the department include an outpatient clinic located within VSRH, along with the department’s presence in five other off-site locations throughout the Vanderbilt Health System. In addition to its highly sought residency training program, PM&R offers educational programs for medical students pursuing careers in multiple related disciplines. The department manages patients admitted to VSRH with medically complex conditions and traumatic injuries who receive care through Joint Commission-certified specialty programs in stroke, traumatic brain injury and spinal cord injury. The department also supports inpatient clinical services at Vanderbilt University Adult Hospital, outpatient services at the Dayani Center for Health and Wellness, and a host of clinical and research services at the Osher Center for Integrative Medicine. “Given the severity of the injuries and illnesses we treat, a high percentage of our patients need rehabilitation services after the acute phase of their hospitalization. PM&R was created to serve as a regional resource for these individuals and has grown to fulfill this need by providing a comprehensive array of regionally distinctive services,” said C. Wright Pinson, MBA, MD, Deputy Chief Executive Officer and Chief Health System Officer for VUMC. Kennedy currently serves as the senior editor of PM&R: The Journal of Injury, Function and Rehabilitation and is on the editorial board of Pain Medicine. He is on the board of directors for the Spine Intervention Society and the board of governors for the American Academy of Physical Medicine and Rehabilitation. He just completed a term of service on the board of trustees for the Association of Academic Physiatrists. “All of us on the search committee were impressed with the extraordinary caliber of candidates that our young department attracted from across the country. However, Dr. Kennedy stood out. He is highly accomplished, wonderfully collaborative, and articulates a brilliant vision for the future of PM&R at Vanderbilt. I am confident that he will be a terrific asset to VUMC’s leadership team and will spearhead this department’s ascent to the next level,” said Sternberg, the George Weeks Hale Professor and Chair of the Department of Ophthalmology and Visual Sciences and Chief Medical Officer for the Vanderbilt Medical Group. Other members of the search committee include: Daniel Beauchamp, MD, Robert Dittus, MD, MPH, Marilyn Dubree, MSN, RN, Michael Goldfarb, PhD, MS, Stephan Heckers, MD, Howard Kirshner, MD, Linda Norman, DSN, MSN, Reed Omary, MD, MS, Margaret Rush, MD, MMHC, Warren Sandberg, MD, PhD, Herbert Schwartz, MD, Heather Skaar, MPT, Reid Thompson, MD, and David Vago, PhD, MS.
Kennedy received his bachelor’s degree from Florida State University, where he also worked as a strength and conditioning coach for the football team under Bobby Bowden. He then obtained his medical degree from University of Florida’s College of Medicine. He completed his internship at Tulane University, followed by a residency in PM&R at the University of Washington, where he served as Chief Resident. He completed his fellowship in Sports and Spine at Northwestern University’s Rehabilitation Institute of Chicago. Before joining Stanford, Kennedy served on the faculty of University of Florida College of Medicine’s Department of Orthopaedics and Rehabilitation Medicine, where he also served as associate director of the department’s PM&R Spine and Musculoskeletal Fellowship. He has a robust practice treating high level and professional athletes from a variety of sports, and has served as a physician for Racing the Planet ultramarathon events in Madagascar, Nepal, Antarctica, the Sahara, Atacama and Gobi Deserts. Kennedy will be joined in Nashville by his wife Lindsey, and their daughter, Arianna.